​​HOUSTON – January 2017 housing statistics have been released by Houston Association of Realtors (HAR). 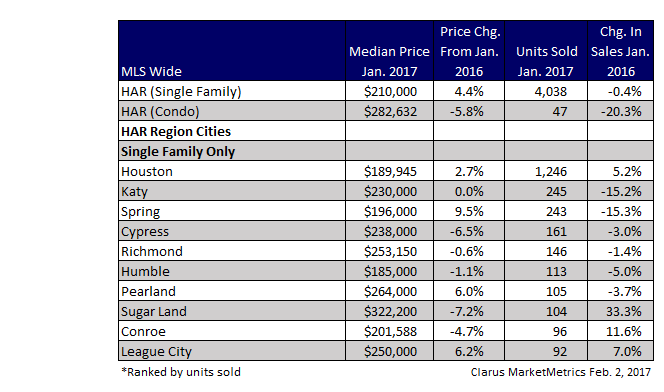 The data compares price changes and sales changes from the previous year for Houston area single-family homes. The report also includes the median price and number of units sold in January 2017. • The median price of existing single-family homes decreased to $210,000 down 7.1 percent vs Dec-16. • Existing single-family home sales decreased 39.0 percent from Dec-16 for a Jan-17 total of 4,038 sold units. • Condos decreased in price to ​$282,632 down 10.8 percent vs Dec-16.